If you’re like many national QSR (Quick Service Restaurants) marketers, you’re already using location data in your marketing mix. With its ability to help drive foot traffic to stores across the country, and produce location insights that help brands make informed decisions about everything from market expansion to new menu items, location data has become a vital part of national restaurant marketing strategies. While QSR’s have leveraged the power of location on a national scale, local and regional marketers in the restaurant industry are just beginning to reap the benefits of location data for their marketing efforts. Location data has the power to relay real-world behaviors to marketers, which in turn can help local marketer efficiently drive visits in specific regions, and attract new customers. In this blog, we break down how location has evolved – it’s no longer just “near me” marketing – and how local QSR marketers can make the most of location data for every part of their marketing plan. Location data and local marketing: they seem like they are the same thing, however, they are actually quite different. In its infancy, location data allowed marketers to send off an ad to someone near a business location. However, as technology has become more advanced, location data provides a complete view of where consumers go in the physical world. It offers a glimpse into people’s everyday behaviors, where people go, and even enables marketers to predict where they’re likely to go next. Now consider local marketing and the huge opportunity the advancements in location data affords. The goal of local QSR marketers is to support individual regions, markets, or franchisee groups by driving visits to their stores. While targeting consumers nationally is certainly effective for increasing store visitation overall, it isn’t necessarily maximizing foot traffic in every market. 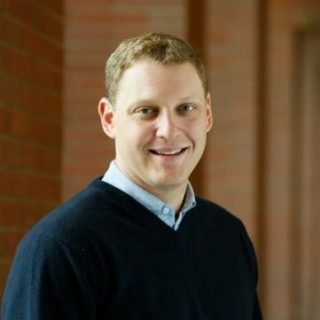 Local marketing needs to consider the unique characteristics of each market — like a brands footprint, competitive footprint, and market size — that national marketing fails to recognize. Location data can highlight foot traffic patterns to QSRs in your target markets right down to the precise location of the restaurant, for both your business and your competitors. This allows for a more robust understanding of a brand’s position in a particular market and how easy or difficult it will be to drive a visit in that market. This knowledge results in more accurate and effective local marketing tactics such as Location-based Audiences, which is made up of consumers who have visited you or your competitors in your market of interest. 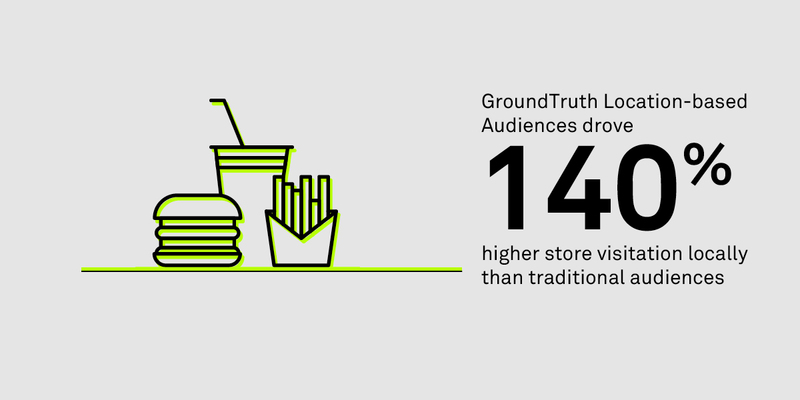 In fact, Location-based Audiences on GroundTruth’s platform have driven 140% higher store visitation locally than traditional audiences. What’s more, brands can employ real-time location targeting to geo-target areas that over-index for visitation to a store. 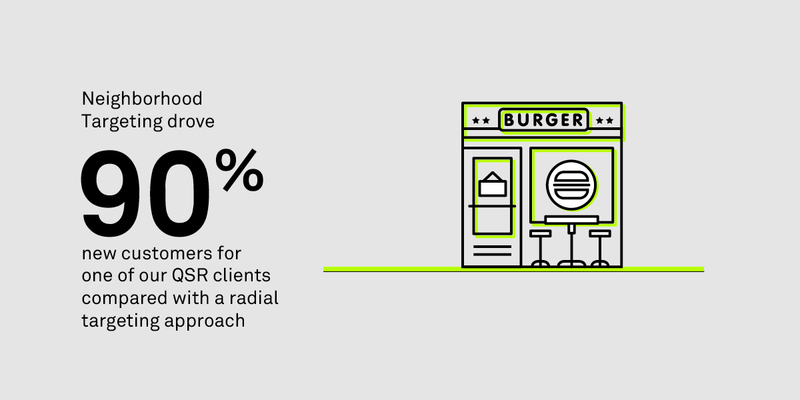 Neighborhood Targeting, which identifies these local areas around a specific business location that over-index for visitation, drove 90% new customers for one of our QSR clients compared with a traditional, radial targeting approach. Location-targeted marketing messages play such a valuable role in national campaigns. But QSR brands do themselves a disservice by omitting location data from their local marketing. Contact us to find out more about how location data can amplify your local marketing strategy and drive even more traffic to your stores.